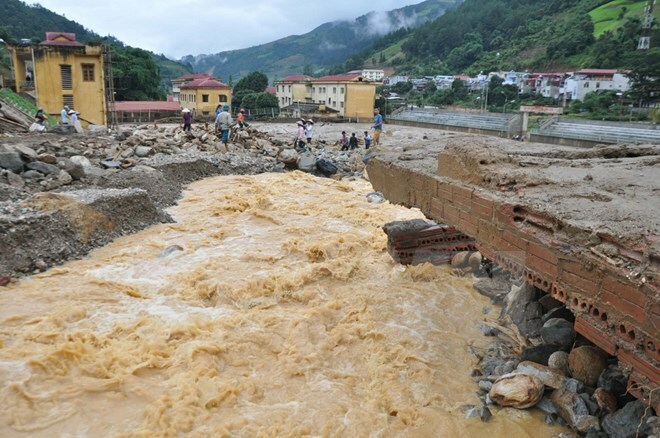 Hanoi (VNA) – As of August 5, heavy rains and floods took the lives of five people and left nine other missing in Yen Bai. The intense flooding caused about 160 billion VND (7.04 million USD) in economic losses in the province. Meanwhile, the disaster claimed the lives of 12 people and made three other missing in the northern mountainous province of Son La. The steering board for natural disaster prevention, search and rescue of Muong La district, Son La province, reported that floods also destroyed 375 houses, submerged 300 hectares of rice fields and swept away thousands of heads of cattle and poultry, causing losses estimated at 657 billion VND (28.9 million USD). Vice Chairman of the National Assembly Phung Quoc Hien on August 6 visited residents affected by the recent floods in Mu Cang Chai, in Yen Bai. Sharing losses suffered by the locals, Hien urged the locality to focus resources on searching missing people, and making rebuilding efforts, including repairing public infrastructure facilities, while keeping a close watch on the complex weather conditions. On August 5, Minister of Natural Resources and Environment Tran Hong Ha also led a delegation to Yen Bai province, during which he handed over 800 million VND (35,200 USD) and 200 beds to the flood-hit locality. He requested the provincial Department of Natural Resources and Environment to work as an advisor for the provincial People’s Committee in cleaning up the environment, ensuring hygiene for water resources and preventing post-disaster diseases.